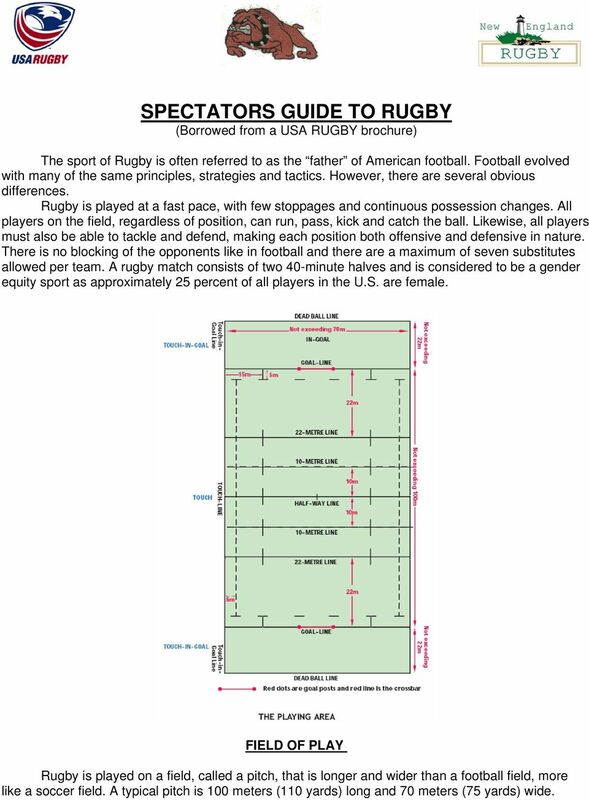 Download "SPECTATORS GUIDE TO RUGBY (Borrowed from a USA RUGBY brochure)"
1 SPECTATORS GUIDE TO RUGBY (Borrowed from a USA RUGBY brochure) The sport of Rugby is often referred to as the father of American football. Football evolved with many of the same principles, strategies and tactics. However, there are several obvious differences. Rugby is played at a fast pace, with few stoppages and continuous possession changes. All players on the field, regardless of position, can run, pass, kick and catch the ball. Likewise, all players must also be able to tackle and defend, making each position both offensive and defensive in nature. There is no blocking of the opponents like in football and there are a maximum of seven substitutes allowed per team. A rugby match consists of two 40-minute halves and is considered to be a gender equity sport as approximately 25 percent of all players in the U.S. are female. FIELD OF PLAY Rugby is played on a field, called a pitch, that is longer and wider than a football field, more like a soccer field. A typical pitch is 100 meters (110 yards) long and 70 meters (75 yards) wide. 2 Additionally, there are meter end zones, called the in-goal area, behind the goalposts. 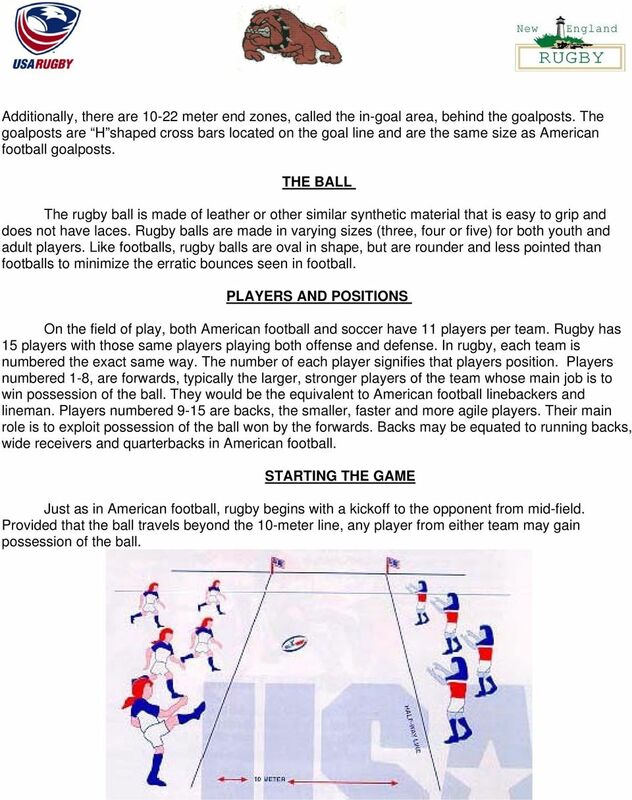 The goalposts are H shaped cross bars located on the goal line and are the same size as American football goalposts. THE BALL The rugby ball is made of leather or other similar synthetic material that is easy to grip and does not have laces. Rugby balls are made in varying sizes (three, four or five) for both youth and adult players. Like footballs, rugby balls are oval in shape, but are rounder and less pointed than footballs to minimize the erratic bounces seen in football. PLAYERS AND POSITIONS On the field of play, both American football and soccer have 11 players per team. Rugby has 15 players with those same players playing both offense and defense. In rugby, each team is numbered the exact same way. The number of each player signifies that players position. Players numbered 1-8, are forwards, typically the larger, stronger players of the team whose main job is to win possession of the ball. They would be the equivalent to American football linebackers and lineman. Players numbered 9-15 are backs, the smaller, faster and more agile players. Their main role is to exploit possession of the ball won by the forwards. Backs may be equated to running backs, wide receivers and quarterbacks in American football. STARTING THE GAME Just as in American football, rugby begins with a kickoff to the opponent from mid-field. Provided that the ball travels beyond the 10-meter line, any player from either team may gain possession of the ball. 5 penalties and teams do not have to play shorthanded. Instead, the non-offending team is usually awarded a choice to kick the ball to gain field advantage. Some of the more important penalties are listed below: Penalty kick: Awarded after a serious infringement of the law. Offenders are required to retreat 10 yards while the opposing team is given the opportunity to restart play unopposed. Teams will often kick the ball up field and out of bounds to gain field advantage. When they do this, play is restarted as a lineout where the ball goes out of bounds. If in range, they may attempt a kick at the goal posts, worth three points. Finally, they may simply tap the ball with their foot and run with it. Free kick: This is awarded after a less serious infringement of the law. The free kick is similar to the penalty kick except if the kick is made more than 22 meters (25 yards) from the defending goal line and goes directly out of bounds, the lineout occurs where the kick was made. Outside the 22 meters (25 yards) the ball goes out of bounds, it goes back to where the kick was awarded. 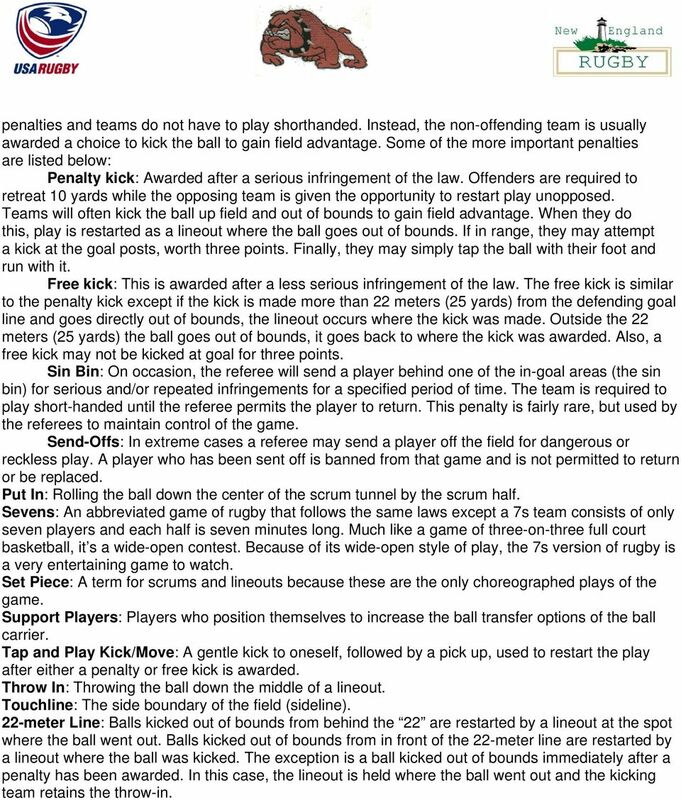 Also, a free kick may not be kicked at goal for three points. Sin Bin: On occasion, the referee will send a player behind one of the in-goal areas (the sin bin) for serious and/or repeated infringements for a specified period of time. The team is required to play short-handed until the referee permits the player to return. This penalty is fairly rare, but used by the referees to maintain control of the game. Send-Offs: In extreme cases a referee may send a player off the field for dangerous or reckless play. A player who has been sent off is banned from that game and is not permitted to return or be replaced. Put In: Rolling the ball down the center of the scrum tunnel by the scrum half. Sevens: An abbreviated game of rugby that follows the same laws except a 7s team consists of only seven players and each half is seven minutes long. Much like a game of three-on-three full court basketball, it s a wide-open contest. Because of its wide-open style of play, the 7s version of rugby is a very entertaining game to watch. 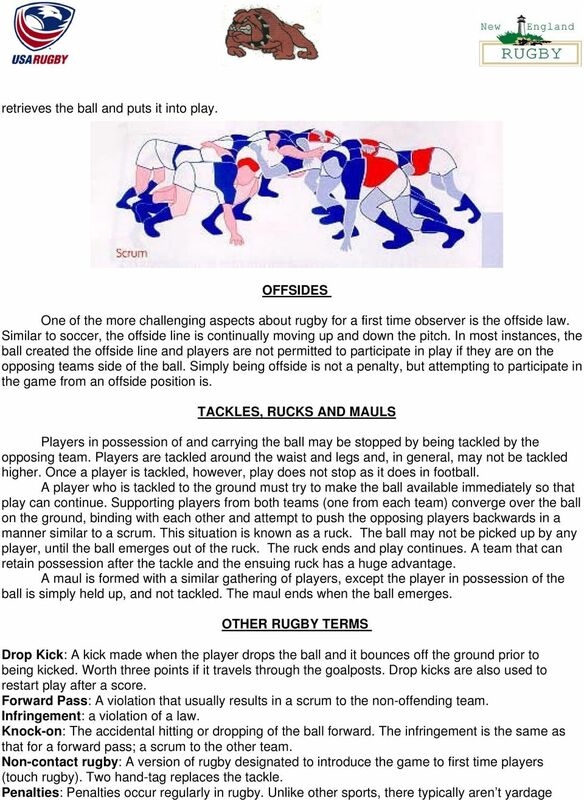 Set Piece: A term for scrums and lineouts because these are the only choreographed plays of the game. Support Players: Players who position themselves to increase the ball transfer options of the ball carrier. Tap and Play Kick/Move: A gentle kick to oneself, followed by a pick up, used to restart the play after either a penalty or free kick is awarded. Throw In: Throwing the ball down the middle of a lineout. Touchline: The side boundary of the field (sideline). 22-meter Line: Balls kicked out of bounds from behind the 22 are restarted by a lineout at the spot where the ball went out. Balls kicked out of bounds from in front of the 22-meter line are restarted by a lineout where the ball was kicked. 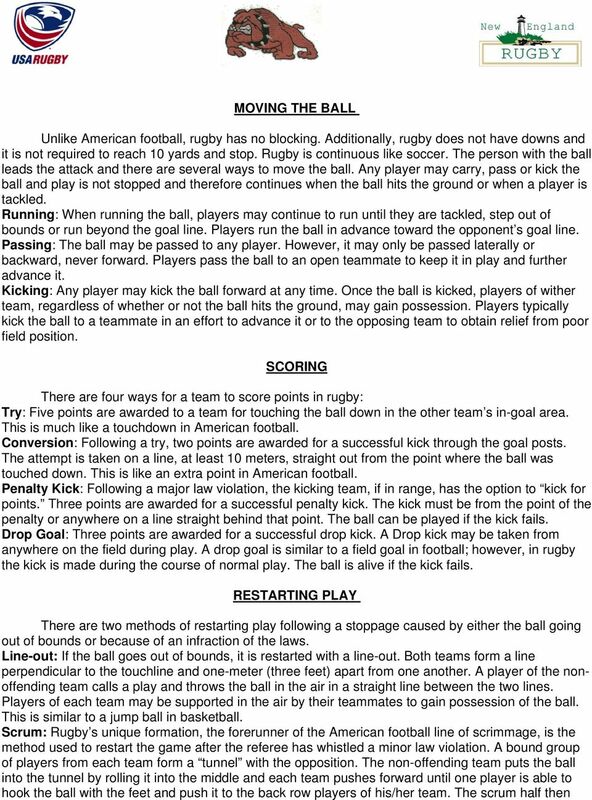 The exception is a ball kicked out of bounds immediately after a penalty has been awarded. In this case, the lineout is held where the ball went out and the kicking team retains the throw-in. DURING THE GAME Coaches will stay on the sidelines. The coach may not come onto the field without the permission of the Referee. SOCCER FIRST INDOOR RULES AND REGULATIONS EACH COACH IS RESPONSIBLE FOR HIS/HER TEAM S FULL KNOWLEDGE OF SOCCER FIRST RULES Teams/Rosters All players must complete a Soccer First waiver/liability release. Player development, as well as administrative and economic concerns, have all been taken into consideration regarding the new playing standards.